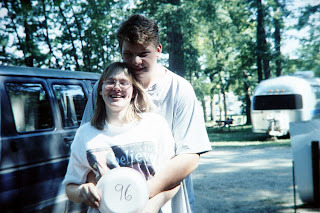 Sara and I met at Spring Arbor College in the spring of 1995. She was a freshman living on Alpha II. I was a dropout who was returning to finish my degree. We didn’t start dating right away; as a matter of fact we really didn’t get to know each other until she returned for her sophomore year. I got her attention that spring with my two beagle puppies. I had gotten them the previous fall, while living with my aunt and uncle in Muskegon, and brought them home with me when I moved back to go to college. In the fall of 1995, I was a part time student with a steady income and lots of time to spend hanging out in the dorms. I remember sitting in the TV lounge one day and spending more time watching the girl sitting on the couch across from me than the TV. It wasn’t long before she started hanging out near me, especially if I brought my guitar to the lounge. We eventually started talking, staying up late, and getting to know each other. Homecoming was just a few weeks away and I was trying to work up the courage to ask her to go with me when, surprise, she asked me. I found out later that she only asked me after putting a letter in the mail in which she broke up with her boyfriend back home. Sucked to be him, I guess. The Homecoming dinner was held in the college dinning commons and I was the MC for the event. Part of my duties included introducing all the couples that had gotten engaged over the past year. I didn’t know at the time that I’d be married to the love of my life less than 10 months later. That night was magical. We held hands, went for a walk, talked about “us,” and decided that “us” was a good thing to pursue. At the end of the night, I dropped her off at her dorm and kissed her. It was our first kiss. One I’ll never forget. That was October 27, 1995. The next night we went to a dance. I’m not all that much into dancing, but every time an opportunity to slow dance came, I made sure Sara was in my arms, slowly twirling around the barn floor. I fell in love with her that night. She looked up at me with a look in her eyes that I would see again on the most special of occasions and I was sold. We realized we needed to let our families in on this. I wasn’t too worried about mine. I was going to be 24 in just a few weeks, getting married was something I knew my family would embrace, even if it hadn’t been discussed or expected. We went to my mom’s office in the morning and broke the news. There was a spontaneous party with her coworkers. I don’t remember telling my dad, but mom must have taken care of it for us. I have a vague memory of her making a phone call to him at work while we were in her office. Telling Sara’s family was another concern. I’d only met her parents a few times. I had asked their daughter to marry me without talking to them about it first. We drove over to their house, about an hour away from school, and sat out in the driveway for a good 30 minutes trying to work up the courage to walk in and make our announcement. We finally took a deep breath, got out of the car, and made our way inside, only to find an empty house. The entire family was out picking up movies to watch from Blockbuster. By the time they returned home, we had chickened out. Pleasantries were had and we were soon watching the first feature of the night, which just happened to be Four Weddings and a Funeral. As the credits rolled, and people started getting up to stretch, grab some snacks, and get ready for the second movie, I managed to blurt out that Sara and I had something we wanted to talk to them about. I remember the room getting really quiet. I got even quieter when I told them that Sara and I wanted to get married. Sara’s brother, Daniel, finally broke the silence by asking if this was a joke because of the movie we’d just watched. I’m pretty sure her parents were mostly just shocked. We talked about marriage, and what it meant. Her dad kept asking me questions about marriage and what I thought marriage was about while trying to use allegories of boats to make his points. That night probably could have gone better, but it could have also gone much worse. The next 8 months went by in a blur. The next thing we knew it was August 10, 1996. We stood in front of God, our families, and friends; declared our love and devotion to each other, and were pronounced man and wife. 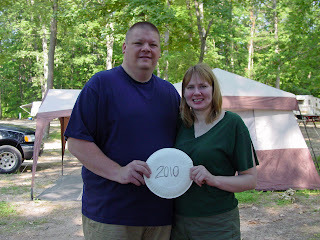 The next 14 years were filled with adventure, devotion, challenges, and even a few disappointments; but mostly they were filled with love; a love that culminated in the story that started its tale in this blog on June 19, 2010. Wow! What a beautiful story of your lives together! Thanks so much for sharing this will of us, Chad. Thank you so much for sharing this beautiful story. Memories that are bitter sweet for you right now, but none the less, they are yours. God bless you. Chad, I've been reading your blog since I read the news article about the accident. I don't even remember how I got to your blog but I'm glad I did. This is my first comment and I want you to know that even through the sadness and confusion, I get an incredible sense of hope and life from your posts. I'm so sorry for your losses and the emotions you are experiencing. I wish I had some words that could take some of your pain. You have lost so much.... Stay strong and keep working through your grief. I'm sure it will help many people to see how you are handling it all. Jill, my mom's side of the family goes camping together every 4th of July. One of our long standing traditions is to take a picture of every family there with a plate showing the year. It would be easy today to just add the year in later with software on a computer, but the plates have a special place in our history. Thanks for your story. My heart breaks for you and your family. It sounds like you are far from alone right now, even though you're living a quiet house. I pray God makes His loving presence very, very clear to you today. Hi Chad - I'm assuming you've always had a gift of expressing your feelings and what an awesome gift to have. You and your family have made such an impact on me (yeah another stranger here who has been following your life) - as strange as it is I think of you, Sara, and Miranda everyday. I think of Sara when I drive into work and pass our local flower shop. I think of Miranda when I hold my 5 month old daughter. And I think of you... your experience so unimaginable yet God's work through you is so obvious and uplifting. You are always in my prayers. As the verse tells us, this life is just a vapor in time. I look forward to the day when all pain ends. God bless. I enjoy so much reading about you and Sara, she was a beautiful person, and from the pictures of her and of you, you both radiate love. Your courtship is so typical of all young people, will the family like us, having the 2 beagles didnt hurt either, they are such great friends too. The picture of you and Sara in 96 is a great one. I am so happy you and Sara had such a good marriage even though right now its so painful, but look at how you grew and became such a great person. In 10 you know next year will be Miranda camping with you. Sara and Miranda are so close to you, all you have to do is reach out and feel the love. Thanks for sharing your love with us. May God continue to hold you in his hand and comfort you. I, like thousands of readers and posters on here, don't know you personally, nor do you know me. I just happened to hear of your story on another board I belong to and curiosity brought me here. I feel like I have so much to say and yet nothing to say at the same time, but I just wanted you to know that I too am thinking of you and am so deeply heartbroken just knowing what you must be going through. I have no idea what you are feeling. I cannot even begin to comprehend what you are going through, and I pray that I never have to endure the pain that you now know as your normal life. Maybe because I have a new baby, born this past November, or maybe just because your story is just so tragic, I just can't stop thinking about you and in a way, wish I could "un-know" your story. I imagine there are times when you feel the same way. For me, time will pass and I will probably stop thinking about you so much, but for you, this is your every day, every moment. For that, I am so so very sorry. I have read many sad things in my life but never shed tears like I did hearing of your story. I know that makes nothing better for you, but I just wanted you to know, there are people who don't even know you who are crying with you. May God give you peace and hope even if just for a few moments a day. You are heavily in my thoughts and prayers. Thanks for reading. beautiful memories! I'm guessing the pastor called y'all Sad & Chara and that's where it came from? I was curious.. I've read most of your posts, I am new to your blog and well... the way you write makes me actually feel.. in a tiny way how you must feel... noticing all the love put in all of those words when writing to Miranda and Sara... you can be sure they're listening to you, right there with you while you go through all of this. Chad, thank you for sharing your stories begining, this is very special and I am truely honored you have chosen to share with all of us, to give us insite into the love and strength the two of you shared...true love is very hard to find in this world, seeing your story gives me hope that I might find it again some day. It has been a long time since I experienced a connection like that in my life...and most of the time I don't believe it will ever happen again. I also learn something new about you each time you share, and I learn about Sara since I never had the privelage to meet her. Again, thank you for sharing such a beautiful and touching story. Thanks for sharing the story...it's a wonderful story. You've made her alive for all of us. The more you share, the more she lives among us. It's a wonderful way to keep her alive in everyone's mind and hearts. Please tell us about some of the fun times you and Sara had, and the mischevious things you and her shared. By sharing Sara and Miranda with us, they become even more loved by us. Chad, your beginning story sounds so much like Russ' and mine (we met in January (ages 18 and 19) got engaged in April and got married in February (ages 19 and 20). I loved reading it. Thank you so much for sharing your heart. Dear Chad, thanks so much for sharing the story with us. On a day like today, it seems that the rain is angel tears and that sadness is harder. I hope that the writing is helping, and I don't know if you really have to say goodbye. I think their spirits are always close, until we get a little more healed and don't need them as close. It's been a couple years since my brother passed, and I know he's still with me.. Some of the things that I hear in my thoughts couldn't be from anyone else. So I echo what someone else posted, that Sara and Miranda are with you. My prayer for you today is that you are carried through, but also that your future will be blessed and that you will know joy, when you are ready. Blessings to you and and to your family and Sara's, today and always, and on your girls. Thanks for sharing this story Chad. I love the Spring Arbor story. My husband and I met and SAU and are living out our journey together. I think about your story daily and will continue to pray for you and your family. Dearest Chad, I don`t know how you can get up each day and live.My problems are NOTHING compared to your loss.Your story has bought tears to my eyes.How can I say ...Hang in there? You are truly amazing to be able to write about it.A huge hug on my behalf and I am so sorry that your love story didn`t have a happy ending.